To succeed in the wild west of the publishing space you need to combine your writing talent with a dose of business acumen. Luckily, this combo is less soul-crushing than you might think. Business can truly be beautiful when it enables you to sell more books, and connect with more readers who truly want to read more of your words. 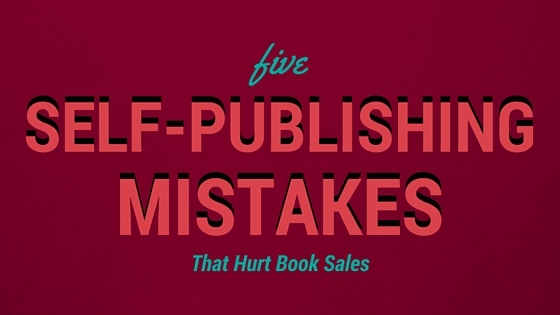 Below are the biggest mistakes most self-published authors make when they first publish their books, plus how to fix them. We love to believe the old adage “don’t judge a book by its cover” is true. However, it’s incredibly false. Most of the books we buy, we buy because of the cover. Unless, of course, we already have a previous love for the author and their work. In that case we usually pick up whatever new book they happen to have written. If you were going to start a publishing company how would you want your book catalog to look? A lot of self-published books give off an amateur feel. To increase your sales it’s worthwhile to work with a professional designer. Platforms like 99designs allow you to create a design brief and have hundreds of world-class designers create book cover mockups for you to choose from. Is your book’s sales description nothing more than the copy off your book jacket? Use a Captivating Headline – Your headline needs to make a promise to you reader that will simultaneously hook their attention. It needs to turn a casual browser into someone interested in your book. Speak To Your Reader’s Problems – Once you’ve sparked interest in your reader you must show them you understand and can empathize. The best way to do this is to speak to their deep needs and fears. This will help build trust. Address The Problem – Diagnose the exact problem your reader is having, and build toward the solution your book proposes. Show Why Your Book Is The Solution – Illustrate how you can take the reader from point A to point B, and showcase why your book is uniquely primed to do so. Also, give a breakdown of the benefits your reader will receive from reading your book. Add a Call-To-Action – Finally, you need to tell them the next step to take. Encourage your reader to buy the book with a strong call-to-action. People who have bought your book before are much more likely to purchase your next release. The most effective way to gather email addresses is to offer an opt-in incentive in the first few pages of your book. This can be a free chapter, a supplementary guide, or even the audiobook version of your current book. Whatever the offer, make sure it’s going to be of value to your readers.Authors who have large email lists tend to sell more books. It’s time to join the club. For more information about how to get started with email list building, see Readers+Writers Journal’s article on how to set up an email list. Your job as a writer is to provide your readers with the most immersive experience possible. In fiction, when readers stumble across a typo it pulls them out of your world. In non-fiction, a typo will start to erode your credibility. You need to hire an editor. As a writer it can be tough to edit your own work because you’re so familiar with every single word it’s too easy to look past glaring errors. A second set of eyes will do wonders for finding story holes, typos, and inconsistencies in your work. Content editing: this level of editing looks for plot holes and major inconsistencies. Copyediting: this level deals with typos and general grammar errors. Final proofreading: this final level is a complete read through after the earlier levels are complete. Brainstorm – Take some time to write down as many book titles and subtitles as possible. You can even source potential title ideas from friends, past readers, and through social media. Get Feedback – Once you have your list of potential titles it’s time to narrow that list down. You can probably cross off a few ideas yourself, but it can be useful to obtain feedback from people not directly involved in the book creation process. This will give you an unbiased perspective of what’s going to help you connect with new readers. Split-Test – Now it’s time to pin your titles against each other. The best way to do this is via split-testing. The easiest way to do this is to run a set of Facebook ads. Simply run an ad with each of your book titles coupled with the same image and see which titles convert the best. The best part about these ads is you can run them for your target demographic. See which title performs the best, and that’s the title that will also sell the best.Thinking like a publisher is a great first step to increasing book sales, but to increase book sales even more and protect yourself legally, you may want to start a publishing company of your own. Succeeding as an author requires you to assume the roles of writer and business owner. By eliminating the mistakes above you’ll see your books start to consistently generate more sales, and move the needle in the right direction. Want to see the full list of tips, tricks and hacks for marketing your book? Want to stay up-to-date on the latest additions to our book marketing ideas archive? Sign up and we will notify you by email. We won’t spam you or give out your email address. Promise. When you say email list, are you inducing connections via LinkedIn or other social media platforms where you can connect directly to people? It’s probably NOT a good idea to email contacts on LinkedIn with promotional material. By email list we mean the emails people have willingly given you in return for something you’ve given them free (a tips sheet, first chapter of your novel, etc.) or who have given you their email address because they want to receive your newsletter. In the United States there are laws about how you can use emails. For instance, you can’t take emails from contacts on LinkedIn and add them to your newsletter list. Thank you. This is great information. At one time or another, I have been guilty of each of these. I still don’t really collect emails; do you? What’s your method? Bad cover – yep. My first cover was SO bad! Bad sales copy – yep. It’s hard! Emails – yep. Or nope. Didn’t use an editor – yyyyesss. I do that now, though! Didn’t test the book title – I didn’t do that and I still haven’t, but why not? That’s smart as hell. The closest I came was asking people if Poggibonsi was a bad title. Our fans and readers are smart. We should ask them about more stuff. READ this and make notes, gang. This will save you a lot of heartache. We’ve discussed a lot of it here on my site, but it never hurts to get a second opinion. This is an excellent article, and just so you know, I found it through Dan’s reblog. I’ll be following your site now, and I’m looking forward to reading many more. This is an excellent blog post when it comes to book sales. Easy mistakes to be done by self published authors.